Learn how to make fluffy dinner rolls with this easy yeast bread recipe. These homemade pull apart rolls are pillowy soft and taste amazing with butter. Serve them at Thanksgiving dinner for your family to enjoy. I am a big fan of pull-apart, fluffy dinner rolls! They are delectable when served warm and spread with soft butter. In my opinion, they make any meal more special, especially when they’re homemade. This recipe is quite simple, and fairly fast because of a short baking time. This is great, but sometimes during busy holiday cooking, you’ll need to shave off even more time. If you need these rolls in a hurry, you can speed up the proving time. To do this, put a casserole dish filled with boiling water in the oven, and place your bowl of dough for your first prove and your pan of rolls for your second prove in the oven. Shut the door to keep the warmth and humidity in the oven. However, don’t put the dough into an oven that is still hot inside from some other bake, as too much heat will cause the yeast to work too quickly. These rolls are soft, but firm enough to spread on some soft butter or dip into soup. They taste wonderful with a plate of baked ham and hasselback potatoes. Are you ready to spruce up your dinner? Or just have a fragrant, comforting afternoon snack? Trust me, the aroma of these rolls baking will get your mouth watering! Looking for more dinner roll inspiration? Try these delicious recipes. Sweet Potato Dinner Rolls: these fancy autumn rolls have hints of cinnamon and sweet potato. Garlic and Asiago Twists: easy dinner rolls flavored with pan-fried garlic, Asiago cheese, and herbs. 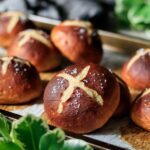 Laugenbrötchen: these German pretzel buns are soft, chewy, and oh-so-good. Leave a recipe rating below to share how you enjoyed these fluffy dinner rolls. Warm the milk in a saucepan or the microwave until it reaches 110-115 F, then set aside. Measure the flour into a large mixing bowl, adding the salt and yeast on opposite sides of the bowl. Mix each one separately with your finger. Crack the eggs into a separate bowl, then dump them into the flour mixture along with the softened butter. Pour in half of the warm milk, and start to stir the mix by hand. Gradually add more milk until a soft, slightly sticky dough has formed. You may not need all of the milk. Knead the dough in the bowl for a couple of minutes until all the flour is incorporated and the dough has come together. Turn out onto a lightly floured surface and knead for about 15 minutes. If it’s quite sticky, sparingly add more flour to your hands and work surface. Towards the end of the kneading, slap the dough vigorously against the countertop to help stretch the dough and develop the gluten structure. The dough is done when it is no longer sticky and has become elastic and silky smooth. Shape the dough into a ball, place in a large buttered bowl, and tightly cover with plastic wrap. Let the dough prove until it is doubled size, about 1 to 1 1/2 hours. Butter a 9x13x2-inch cake pan and set aside. Turn out the dough onto a clean countertop that hasn’t been floured. Punch it down all over to knock out any large pockets of gas. Divide the dough into 12 equal parts, weighing the dough on a kitchen scale for accuracy. To shape each roll, punch down a blob of dough into a rough circle. Fold the edges into the middle and pinch them together. Place the dough seam-side down on a clean, non-floured countertop and cup one hand around it. Applying some downward pressure, move your hand in a circle to roll the dough into a tight ball. Repeat with the remaining dough. Arrange the rolls in four rows of three in the pan, then cover tightly with buttered plastic wrap. Let the rolls prove again until they are doubled in size and the dough springs back when lightly pressed with a fingertip, about 45 minutes. About 10-15 minutes before the rolls are fully risen, preheat the oven to 425 F.
Bake the rolls in the middle of the oven at 425 F for 10-13 minutes. They should be well risen and golden brown, and have an internal temperature of at least 190 F.
Brush the softened butter onto the tops of the buns as soon as they come out of the oven. Serve immediately, or turn them out onto a wire rack to cool. If you’re in a hurry, you can speed up the proving time. Put a casserole dish filled with boiling water in the oven, and put your bowl of dough or pan of rolls into the oven to prove. Shut the door to keep the warmth and humidity in the oven. Don’t put the dough into a hot oven, though, as too much heat will cause the yeast to work too quickly. Ideally, it’s best to plan ahead and make the dough the night before. Put the bowl of dough in the fridge overnight, then proceed as normal the next day. This results in a slower prove and better-flavored dough. Keep the cooled rolls in an airtight plastic container for up to 24 hours, or freeze for later. Don’t store in the fridge, as it will make the bread go stale quickly.